In The Flesh is BBC3's recent zombie drama written by Dominic Mitchell. The show provides a clever twist on the zombie genre as it's about zombies being 'cured' and reintegrating them into society. 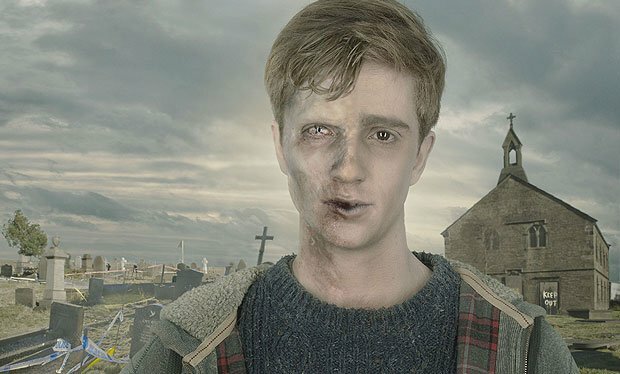 The drama focuses on a death-faced teen who's been cured of his zombie condition but he struggles to reconnect with his family, and society as a whole. BBC's Writers' Room recently made the first episode available to read. 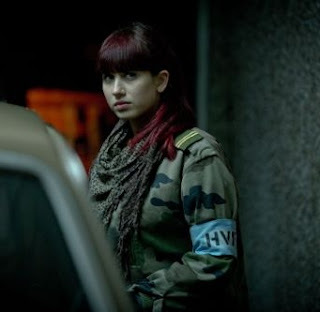 As per my previous 1st ten pages breakdown of Jed Mercurio's Line of Duty (where we learned how to jump start your script), let's examine the 1st ten pages of In The Flesh and see what we can learn. DOWNLOAD THE SCRIPT HERE, take a read of the 1st ten pages, or more should you feel the urge. On the title page, it says it's a Final Shooting Script so no doubt been through many revisions and the benefit of a lot of development input, but no matter, it's still a useful exercise to examine how the script begins. CLOSE ON A JUMBO PACK OF MONSTER MUNCH - A female hand reaches into frame and plucks the crisps from the shelf. This is 'directing on the page' which is generally frowned upon in the spec script market but as this is a final shooting script, no-one's going to kick up a fuss here. In general though, if you do want to 'direct on the page', use it wisely. Here it's specifically for the first three shots, and then not used again. A normal shopper with a blood-encrusted BLUE ARMBAND on her right bicep. The band reads “Human Volunteer Force”. A normal shopper in what seems to be a completely deserted supermarket. As a spec script, we still don't know the exact style and tone (or indeed, the premise) of the story but already, there's a slight edge to the proceedings, something unsettling and unnerving. And what does 'Human Volunteer Force' mean? By the end of page one, the girl in the supermarket falls over a dead body. This is particularly effective for the end of page one as it prompts the reader to find out what's going to happen next. Immediately on page 2, we know we're in horror territory as the dead body is being eaten by a zombie. The girl who fell over is accosted by a young male zombie, while off-screen dialogue prompts 'Kieren' to snap out of his reverie. In scene 2, the premise of the story is established: Kieren was a zombie but he's been 'cured' and he's going home (although the reliability of the medication seems uncertain.) Kieren is wary of returning home. He doesn't feel ready. The action cuts to the town of Roarton (good name) where Kieren's family live and we get introduced to dad Steve, mum Sue and teen tearaway Jem. The scenes here have a lighter touch, a nice blend of characterisation and dialogue ("...you're going to be seriously grounded." "Instead of what, Dad? Hilariously grounded?"). It's quite a lengthy sequence with the family but the end of scene 10 (page 9) uses a neat transition (the cut from 'scenic' to 'grim'), and we rejoin Kieren at the zombie treatment centre. By the end of page 10, Kieren's sharing his sensitive worries with a zombie group, and he generates some empathy from the reader. only war veterans have the misfortune to see. Some Nazi script readers might pounce on this as it's information for the reader, but it's only one sentence and doesn't disrupt the overall flow. The main thing to take from these ten pages is the use of a flashback/dream to begin the script. Here, the flashback doesn't overstay its welcome, it's intriguing and the transition link to Kieren's current situation entices the reader to find out more. Dominic Mitchell talks about how In The Flesh developed as a project here, and you can follow him on Twitter here. I'm a great fan of "In The Flesh" but believe its strength is in substance rather than style. Firstly the concept, secondly the storytelling, and later the introduction of so much potential allegory. When I watched it first I bemoaned the lack of strong characters in Kieren's parents, and indeed most are defined by their reaction to the main event. Now I see from the script that only Jem is actually described at her intro. There is very little individual style in dialogue or gesture, no Hans Solo on the horizon. However, if I could only storytell this well... ! I teach screenwriting, so I suppose I'm one of those guru Nazis who bemoan backstory in scene description. For my part, I'm not trying to do anything except draw attention to when a writer is over-using a convention or getting lazy with visual storytelling. If I don't tell beginning writers to use that device sparingly or not at all (along with voice-over, flashbacks, and other cool conventions that beginning writers love to lean on) then he/she will lean on it all the time. I've seen dozens and dozens of examples. So I'm glad you said "a small amount" and then just used a sentence excerpt. It's a good example of a writer who's studied the craft, likely knows the rules, and found a clever and concise way to break one. Thanks, John. I've seen scripts where the writer sticks to visual description but it can read flat, cold or dull 'cos there's no tonal context of what's happening. It's all about storytelling skill, I guess, to engage the reader at every given moment, but not to overburden them with dull information!